It's not out yet... well, it kind of is. It's been on tap at ISE's and maybe Gahan in some form before... and may still be... anyway, it'll soon be here for "real". Apparently the lager's in the can (literally) and is just waiting for a release in the second week of June or so. Look for the official commercial online May 22nd. In the meantime, here's a couple of pics of the new brew, plus a video of outtakes from the commercial. 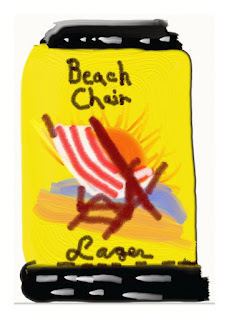 If you still want to see the images of the real thing, look no further than the super-secret Facebook page for Beach Chair Lager. I must say, I like the can design more than I thought I might (except the mixed fonts), and although I don't care a ton for the name, the "Grab a Chair" slogan's a great fit for it.